In early 2017, the state of California adopted a new method of evaluating school quality across the state that includes multiple measures of student performance. This new accountability system is composed of two sets of measures - 6 state-specified measures that are common across schools and local educational agencies (LEAs) and 5 local measures that can vary somewhat between schools and LEAs. Each year, the California Department of Education (CDE) gathers the data needed to calculate results for each of the state measures and report the results publicly via the California School Dashboard. It is the results for these common state measures that are used in the Oakland Public School Report Cards, focusing on re-presenting the information in a simple, single-page display for each school. Click HERE or HERE to view CDE resources on the 2018 dashboard. 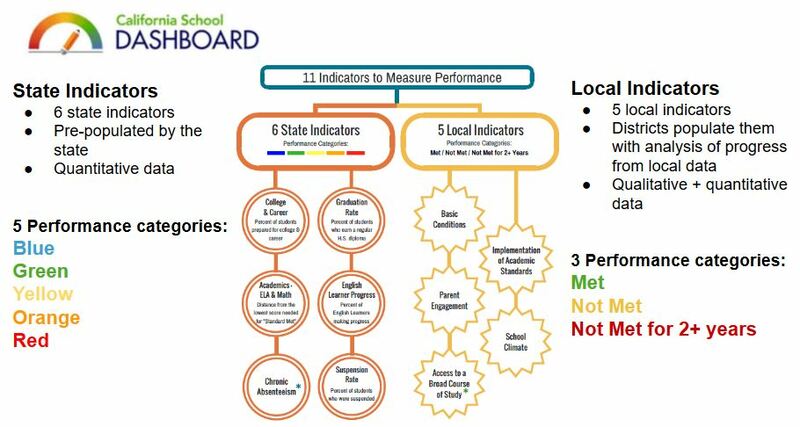 The California School Dashboard has 6 state indicators and 5 local indicators. The state indicators are Academic (ELA and Math), Graduation rate, Suspension rate, English Learner Progress, and College/Career preparedness. The performance categories for the state measures are blue, green, yellow, orange, and red, from high to low performing. Unlike the state indicators which are calculated by the California Department of Education for all publicly funded schools and districts, the five local indicators are calculated/reported by individual local educational agencies or school districts. The performance levels for the local indicators are met, not met, and not met for two or more years. The measures (and relevant gradespans) for which full data are currently available are the Academic Indicator for ELA and Math (grades 3-8 and 11), Graduation Rate (9-12), Suspension Rate (K-12), Chronic Absenteeism (K-8), and College/Career (9-12). As of Fall 2018, English Learner Progress (K-12) Indicator results will be suspended for one year due to the switch to a new English Language Proficiency exam (the ELPAC). See the descriptions of individual measures below for information on what school year data are available in the current release (see also this CDE page). The academic indicator is actually made up of two separate measures (English Language Arts or ELA and Math) derived from student performance on the standardized state assessment, the Smarter Balanced Assessment Consortium (SBAC) test. Status is calculated as the distance in scale score from the lowest score needed to meet standards, averaged across students, and change is calculated as the difference in this average distance from standard (DFS) between the two most recent years of available data. The results for this indicator are reported separately for ELA and Math and apply only to students in grades 3-8 and 11. In the Fall 2018 release, data for status are from the 2017-18 school year and change represents the difference in results from 2016-17. Click HERE for more information on the Academic Indicator. *Changes in Fall 2018 reporting - Grade 11 results are now reported and have new cut points for determining performance levels. DFS abbreviation replaces DFM abbreviation. For traditional schools, the graduation rate indicator is a measure of the four year cohort graduation rate and the change between this rate and that of the prior year. In the Fall 2018 release, data for status are from the 2017-18 school year and change represents the difference in results from 2016-17. District-wide graduation rate results now include alternative school data, which utilize a one year graduation rate calculation rather than the standard graduation rate calculation described here. Click HERE for more information on the Graduation Rate Indicator. *Changes in Fall 2018 reporting - Prior to Fall 2018, graduation rate change was measured against the prior 3 year average; Alternative schools now show one year graduation rate results for this indicator; Changes to which students count as graduates; Safety net methodology (removal of increased sig. and declined sig. from reference grids when fewer than 150 students are in the cohort) applied to student groups. This indicator measures the percentage of students who graduate and complete at least one additional requirement preparing the student for college and career and the change in this rate from one year to the next. As of the Fall 2018 release, status data are from the 2016-17 school year and change is measured relative to the 2015-16 school year. Click HERE for more information on the College/Career Indicator. See also THIS description from the CDE. *Changes in Fall 2018 reporting - Status, change, and performance data are now available. New criteria for preparedness include the State Seal of Biliteracy and Military Leadership (ROTC) training. Alternative (DASS) Schools will use a one year graduation cohort (as is applied in their Fall 2018 graduation rate indicator) in calculating the college/career indicator results. *Changes in Fall 2018 reporting - Results for this indicator will not be included in Fall 2018 due to the switch to a new English Language Proficiency assessment. The suspensions indicator measures the rate of suspending students (in and out of school; one student suspended more than once is counted only once) and the change in this rate between the two most recent years of available data. In the Fall 2018 release, data for status are from the 2017-18 school year and change represents the difference in results from 2016-17. Click HERE for more information on the Suspension Rate Indicator. *Changes in Fall 2018 reporting - application of safety net methodology (removal of increased sig. and declined sig. from reference grids when fewer than 150 students are cumulatively enrolled) to student groups. This indicator shows the percentage of students in grades K-8 who missed 10% or more days of school and the change in this rate from one year to the next. Students must be enrolled for 31 days in a school or district to be included. The data for status in the Fall 2018 release are from 2017-18 and change is measured as the difference between the rate from 2016-17 to 2017-18. This indicator was not included prior to the Fall 2018 release. Click HERE for more information on the Chronic Absenteeism Indicator. *Changes in Fall 2018 reporting - Data are now available; Safety net methodology (removal of increased sig. and declined sig. from reference grids when fewer than 150 students are cumulatively enrolled) will be applied to the all student results and to results for student groups. 5x5 reference grids show how performance is translated from the combination of status and change. For some indicators, a single grid can be used in this result translation (like Graduation) regardless of school or LEA type, whereas for others there are a set of reference grids that are relevant only for a given LEA or school type. Click HERE to view the reference grids for previous releases of the CA School dashboard.